This section includes Islamic/Arabic clothing for women: abayahs/jilbabs and scarves/hijbas. 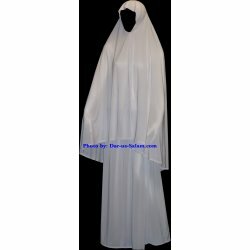 Abayahs / Jilbabs There are 6 products. Satin fabric snap button abayah silver and gold embroidery starting at the top of V-shaped neckline , on sleeve cuffs,and all the way down of this abayah, a matching shawl included Approximate Sizes: Medium - 5'2"-5'4" | Large - 5'5"-5'7"
V-shaped neckline and snap buttons from top to bottom .Hand Embroidered in pink on sleeve cuffs,middle of back and bottom of this abayah.This abayah is Georgette fabric, comes with matching shawl for a look of elegance. V-Shaped snap button abayah made of Georgette fabriccolorful two layer sleeves chiffon and light squin on sleeve cuffs .This abayah is Georgette fabric, comes with matching shawl for a look of elegance. 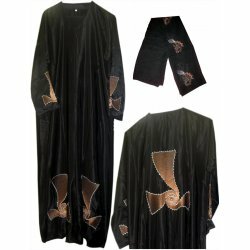 Satin fabric snap button abayahV-shaped neckline with hand sewn hazel and silver embroidery on sleeve cuffs,middle of back,and button of this abayah matching shawl with the same design.